I was looking at my (few) February's posts and I noticed it's all pinks! So you know what? I went for yet more pink to end this month! This is an older mani that I never posted somehow, but that I loved back then. My base is Gabriella Salvete no. 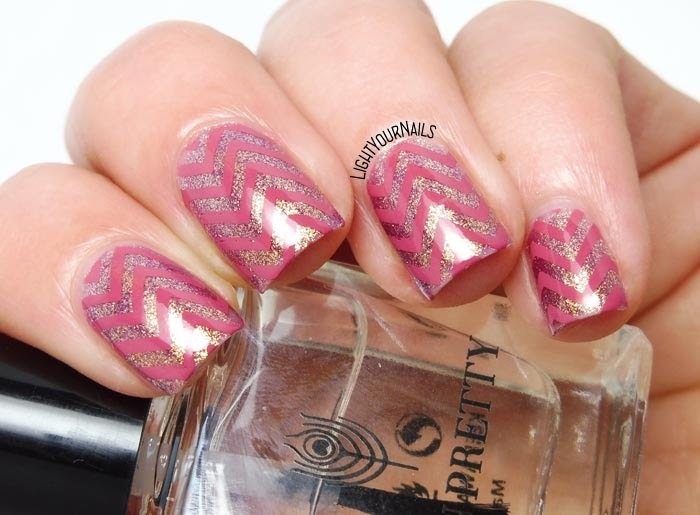 141 stamped with my beloved Bornpretty's special stamping polish in no. 11 and plate QA91. In the pics I am holding my go-to top coat for nail arts a.k.a. Bornprettystore's No Smudge top coat. This is no smudge for real, I love it. Unfortunately it's not as glossy as I would like it, too, so sometimes I top coat it again with something glossier. I don't know if the colour choice is the best, I should have probably used a lilac for stamping but I loved it so much anyway. If you struggle with your top coat smudging your nail arts I suggest you to give this one a try! I am one week late showing you my Valentine's Day mani. Whether you celebrate it or don't give a cent it's just an excuse for a themed nail art! Me, I went out for dinner and did a nail art. I opted for some pink this year. My base polish is Catrice ICONails 29 Donut Worry Be Happy!, stamped with a hearts pattern from DRK-A large stamping plate and Bornpretty's special stamping polish in no. 11. I decided to make my mani matte but I actually hate this Butter London top coat and need to find an alternative. That's it! Quick as usual. How do you like my mani? 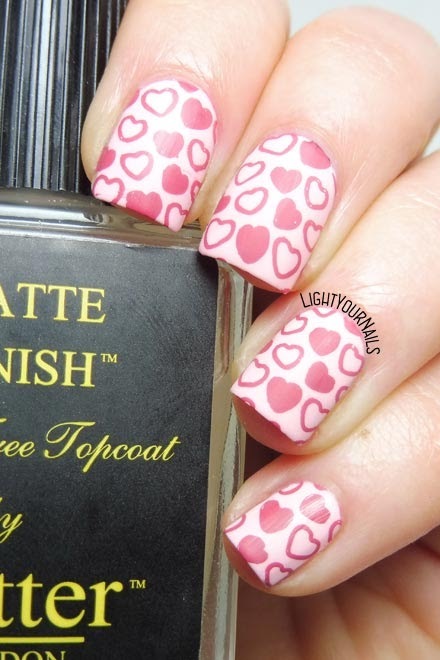 Sweet mani today as Valentine's Day is coming by! This is Nyx Girls NGP239 Golden Lavender. Despite the name I think it's a pink nail polish leaning lilac/lavender. It's filled with a gorgeous golden shimmer which is my favourite. Formula is really thin and you need at least 3 coats for a decent coverage but it's really easy work with. Drying time is not bad either. I hate that the formula is so thin but the final mani is lovely. Such a dreamy shade! And look at that shimmer! How do you like it? Have you ever tried Nyx nail polish? I start feeling Valentine's Day vibes in the air you guys! Every store is showing up heart shaped stuff in pink and red these days. And because I am no sensitive girl (sarcasm) I got on the train myself. 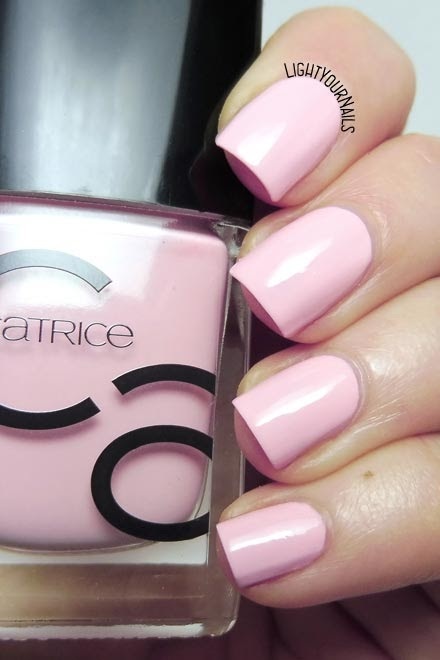 Here's another pink nail polish that should be the base for my next nail art. 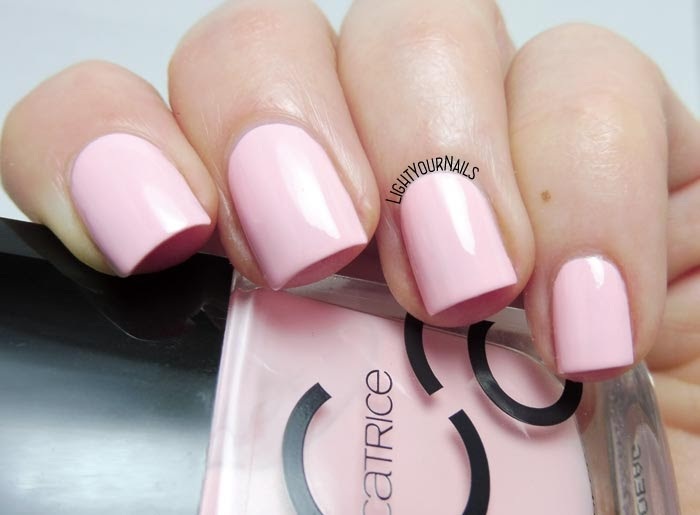 It's Catrice ICONails 29 Donut Worry Be Happy!, a light pink creme. The formula is on the thicker side but applies quite easily actually. Drying time is not the best but still very acceptable. It doesn't dry too glossy so you'd better use a top coat. Is it my favourite pink ever? I wouldn't say so. It's a good pink though and will be a great nail art base for sure. Are you feeling romantic vibes, too? 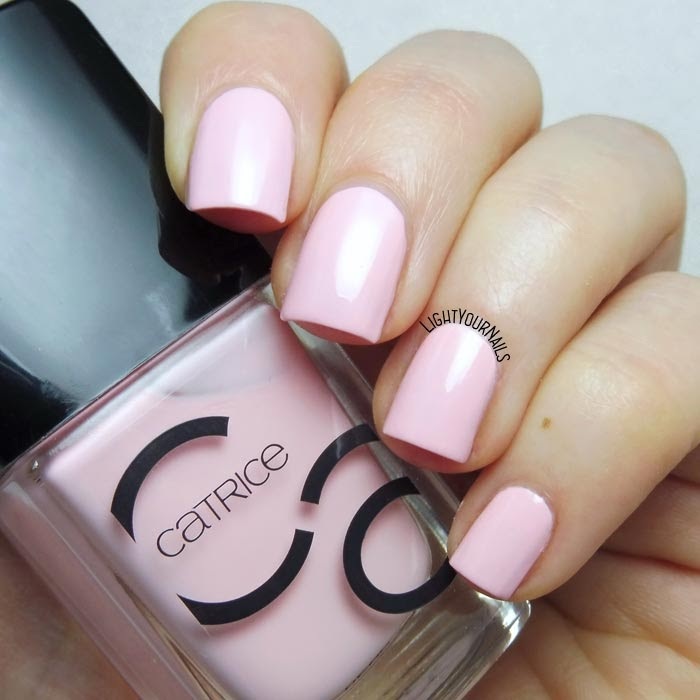 Catrice ICONails 29 Donut Worry Be Happy! Quick post today! I am showing you a nail polish that I bought last year on sale at H&M. It was part of a trio, the other two shades being a burgundy creme and a purple glitter. I actually meant to use them together but the purple glitter doesn't really work with the other two. Oh well. This is H&M Secret Pink, a bright pink creme, easy to apply, perfectly opaque in two coats, glossy and fast drying. Thumb ups again for H&M! I had meant it to be the base for a Valentine's Day mani but I've been sick in bed these last few days and it just chipped in the meanwhile. Next time! Anyway, I really loved wearing something this bright during a cold snowy week! Do you like it? Have you ever tried H&M cosmetics?